The Indianapolis Colts today signed free agent outside linebacker Victor Butler to the active roster and waived defensive tackle Kelcy Quarles. Butler, 6-2, 245 pounds, was first signed by the Colts as a free agent on October 6, 2014 and recorded three special teams tackles in two games this season. He was then waived on November 18. For his career, Butler has totaled 65 tackles (48 solo), 11.0 sacks, five passes defensed, three forced fumbles, two fumble recoveries and 46 special teams stops in 65 games played (two starts) with the Colts (2014) and Dallas Cowboys (2009-2012). He was originally selected by the Cowboys in the fourth round (110th overall) of the 2009 NFL Draft out of Oregon State. Quarles was signed to the Colts active roster from the New England Patriots practice squad on September 16. He played in two games this season and recorded 1.0 sack and one pass defensed. Quarles played in 35 games (28 starts) in three seasons at the University of South Carolina and posted career totals of 105 tackles (66 solo), 13.0 sacks, 23.5 stops for losses and eight quarterback pressures. This week’s “Back-Up of the Game” presented by Venyu is running back Boom Herron. Sunday might have been Boom Herron’s first career NFL start but the crowd inside Lucas Oil Stadium already had his first name in their cheering repertoire. Herron gave them a lot to cheer about on Sunday with 12 carries for 65 yards and five receptions for 31 yards. “I was just honored that the coaches gave me the opportunity and the coaches believed in me. It was a great moment for me,” Herron said of getting the start. 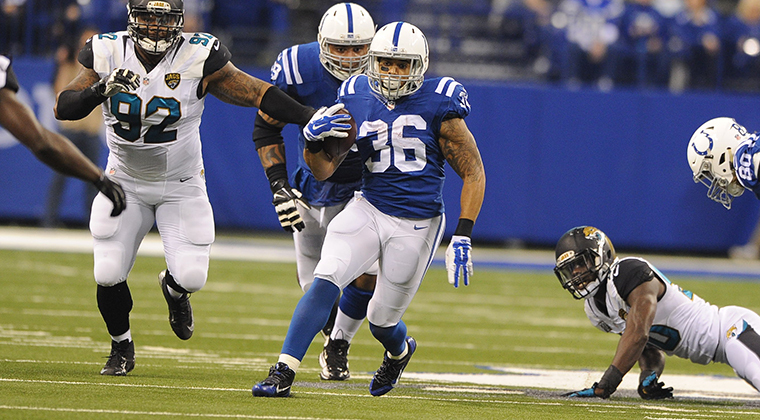 Herron entered the Colts 2014 Training Camp as the team’s fourth string running back. Yet, as is typically life in the NFL, more than a couple of running backs are needed to survive a 16-game regular season. Of the Colts 74 offensive snaps on Sunday, Herron played 31. The expanded role for Herron was expected after the Colts placed Ahmad Bradshaw on injured reserve earlier in the week. Talk during the week had fans wondering if the Colts would explore other options at the running back position. On Sunday though, it was Herron taking charge. “They got me the ball a couple times and I tried to make something happen with it,” Herron said after the win. INDIANAPOLIS – Behind a stout defensive effort, the Colts (7-4) recorded a 23-3 victory over the Jacksonville Jaguars (1-10) in Week 12. The win was the Colts 13th in 14 tries following a loss under Chuck Pagano. The Colts will now wrap up their three-game homestand with a visit from Washington (3-8) on Sunday afternoon. MORE “RESILIENT” COLTS—It’s one thing to talk about it, it’s a totally different ordeal to carry that out. The Colts have preached resiliency in bouncing back from losses and Sunday was another case of it. Under Chuck Pagano, the Colts have now won 13 games following their 14 losses, a feat that is why the team is staring at a third straight postseason appearance. STOUT DEFENSIVE EFFORT – Following a disappointing effort against the Patriots, the Indianapolis defense put together one of its best performances of the year on Sunday. The Jaguars had less than 100 yards of total offense on their first 11 drives and the lone three points scored came on a short field. HILTON BACK IN BUSINESS – Sunday will be one that T.Y. Hilton won’t soon forget. Hilton rose quite early on Sunday morning with the birth of his daughter around 7:30 a.m. He headed to work later and put in quite the day at the office. Hilton’s 73-yard touchdown tied the longest of his career and he reached the 1,000-yard plateau for the second straight season. CRIBBS’ IMPRESSIVE IN DEBUT – It took just one touch from Josh Cribbs to show why the Colts signed the veteran kick returner. Cribbs’ 46-yard kick return to start the game on Sunday was the Colts longest kick return since 2012. Even with his third-quarter punt return for a touchdown that was called back, Cribbs showed plenty to add to the Colts playmaking ability. DIVISIONAL LEAD EXPANDS – The Colts entered Sunday with just a one-game divisional lead, the smallest they’ve had in over a month. That lead grew to two games with the Colts (7-4) win and the Texans (5-6) dropping a home contest to the Bengals. The Colts have a two-game lead in the AFC South with five weeks left. Houston comes to Lucas Oil Stadium in Week 15.